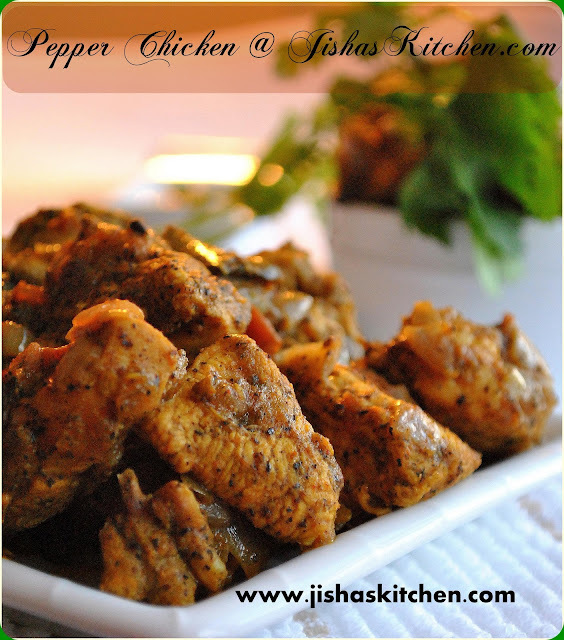 Today I am sharing the recipe of Spicy Pepper chicken which is one of my favorite chicken dish. Here pepper powder and green chillies are used more than red chilly powder and coriander powder. Wash and chop chicken to medium size pieces and allow it to drain. Then marinate the chicken pieces with lemon juice, 1 1/2 tsp ginger-garlic paste, 1/2 tsp turmeric powder, 1 1/2 tsp pepper powder and salt. Then refrigerate marinated chicken pieces for about 30 minutes. Then heat oil in a pan and saute chopped onions and crushed/chopped green chillies till the onions become soft. Then lower the flame and add chilly powder, coriander powder, cumin powder and 1 1/2 tsp pepper powder and fry for less than a minute and then add garam masala and chopped tomatoes and fry till the tomatoes become soft. Then add marinated chicken pieces along with curry leaves and mix it well. Then cook chicken pieces covered in a medium-low flame for about 20-25 minutes. Do stir in between. Note: No need to add water, as the chicken will cook in its own juice. Then simmer uncovered for about 5-10 minutes or till the gravy becomes thick and remove from the flame. Note: You can adjust the amount of pepper powder and green chillies according to your spice preference level. Since my family prefer this recipe to be little bit spicy. I prepared it by adding about 4 tsp pepper powder (2 tsp for marination and 2 tsp later) and about 7 green chillies. Enjoy with Chapathi / Rice. 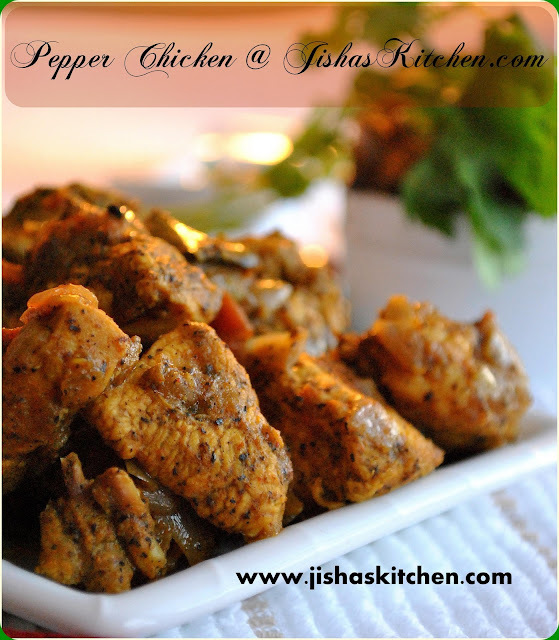 yum yum...looks too good...we too made pepper chicken this weekend! Check out a new event and giveaway at my blog! Pepper chicken adipoli.you are queen of non veggies. 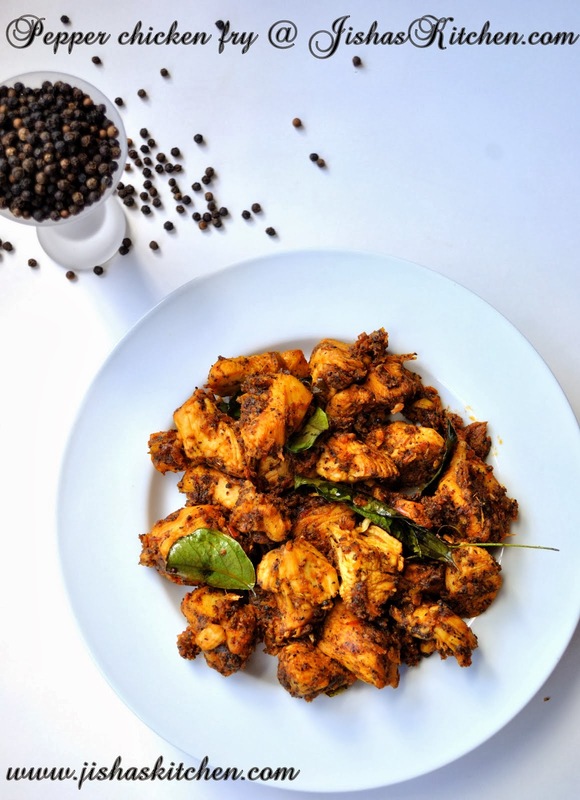 Adipoli tto...Nalla kidilan pics too Jisha..Nothing can beat this pepper chicken, perfect aytunde..
Pepper fish looks very tasty, Jisha..Great recipe! 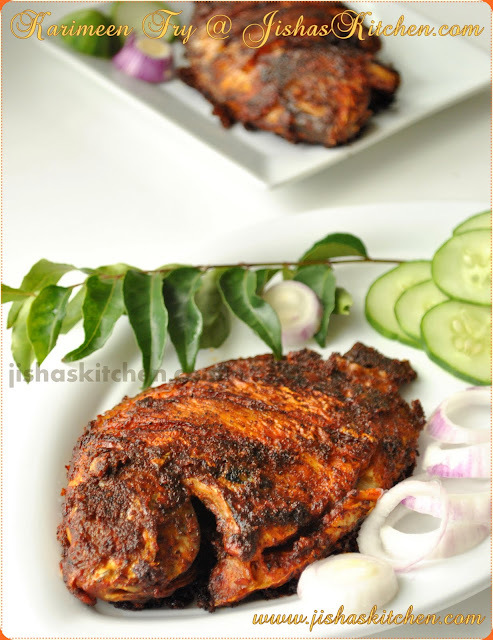 Malabar fish masalayum adipoli aayittundu ketto..Nalla tempting color! Spicy and yummy chicken, lovely pictures. Wow...this recipe sounds scrumptious n irresistable..u rock da..
Wowie !!! I love Pepper Chicken. Keep Posting !!! You have a very lovely blog. The recipes are so kool and the photographs speak volumes about your passion for blogging n cooking. even i love it spicy...looks tempting.You have a wonderful blog here with mouth watering recipes.